Pericardial mesothelioma is much less common than malignant mesothelioma of the pleura or peritoneum. In fact there are only about 150 cases ever reported in the medical literature. It affects the section of the mesothelium called the pericardium (the mesothelial lining of the heart). People in the fourth to seventh decades of life are most likely to have this cancer, and there is a 2:1 male to female ratio. Currently, surgical excision (removal) of the pericardium is the treatment for pericardial mesothelioma, primarily to lessen symptoms of constriction around the heart. A recent review of the primary pericardial mesothelioma has been published by Vigneswaran and Stefanacci. It is a rare neoplasm with a reported incidence of 0.0022% in an autopsy series of 5,000,000 case studies 212 and a calculated annual incidence of 1 in 40 million in a Canadian epidemiologic survey. An antemortem diagnosis was made in less than one-third of 150 reported cases in the literature. Pericardial mesotheliomas can occur at any age, but people in the fourth to seventh decades of life are most likely to be afflicted, and there is a 2:1 male to female ratio. Patients generally present with a pericardial effusion, congestive heart failure, an anterior mediastinal mass, or tamponade. Diagnosis can be difficult given the nonspecific presentation, and chest radiography may demonstrate only an enlarged cardiac silhouette. Echocardiography can reveal evidence of an effusion, thickening of the pericardium, or mass involvement of the myocardium. CT scanning or MRI can show a thickened pericardium and may help determine invasion into myocardium. Currently, surgical excision is the treatment for primary pericardial mesothelioma primarily to palliate symptoms of constriction or tamponade. Mesothelioma of the tunica vaginalis testis is the least common type of malignant mesothelioma (amounting to less than 100 of all documented cases of the disease) and affects the section of the mesothelium called the tunica vaginalis testis (the mesothelial lining around the testes). Most patients are in their 50s or older, but about ten percent of the patients are younger than 25 years. Patients generally present with a hydrocele (an accumulation of serous fluid in a sac-like cavity (as the scrotum)) or hernia. Treatment is usually a high inguinal orchiectomy (surgical excision of the entire affected testis through an incision in the lower abdomen - called also orchidectomy). Prognosis is somewhat better than for pleural mesothelioma. Fewer than 100 cases of gonadal mesothelioma have been reported in the literature, and although most patients are in their 50s or older, approximately 10% of the patients are younger than 25 years. Asbestos exposure is documented in approximately one-half of the more recently reported cases. Patients generally present with a hydrocele or hernia. An accurate preoperative diagnosis has been reported in only two cases. All patients with a suspected testicular malignancy should undergo a radical or high inguinal orchiectomy. Local resection of the tumor or hydrocelectomy is associated with a high recurrence rate compared with high inguinal orchiectomy. Because preoperative diagnosis of gonadal mesothelioma is difficult, management should be as for any testicular tumor. The inguinal approach avoids interruption of the scrotal lymphatics, which would alter the metastatic pathway of the tumor, and also allows complete removal of the spermatic cord up to the internal ring. Patients with evidence of disease extending into the retroperitoneal nodes should undergo a retroperitoneal lymphadenectomy. The overall recurrence rate (local and disseminated) for gonadal mesothelioma can be as high as 52%, with 38% of patients dying of disease progression. Local recurrence occurs in 36% of patients who undergo local resection of the hydrocele wall; 10% after scrotal orchiectomy and 12% after inguinal orchiectomy. More than 60% of recurrences developed within the first 2 years of the follow-up. The median survival of the patients averaged 23 months. 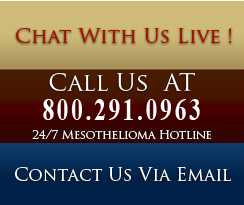 There are little data regarding the use of adjuvant therapy after resection of gonadal mesothelioma.